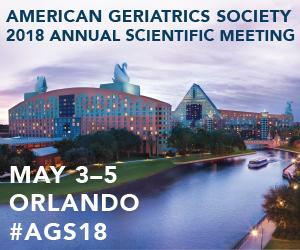 The American Geriatrics Society (AGS) today announced that Bruce Leff, MD, AGSF, a Professor of Medicine and Director, Center for Transformative Geriatric Research, at Johns Hopkins Medicine and the Johns Hopkins Bloomberg School of Public Health, will deliver the prestigious Henderson State-of-the-Art Lecture at the AGS 2018 Annual Scientific Meeting (#AGS18; May 3-5 in Orlando, Fla.). Dr. Leff's lecture, "Look Homeward, Medicine!," will focus on our growing population of home-bound older adults, describing the spectrum of home-based medical care services and innovative models changing both where and how we age. "Supporting high-quality, person-centered care for us all as we age means meeting older people where they are," noted Ellen Flaherty, PhD, APRN, AGSF, AGS Board Chair. "Dr. Leff has played a critical role in shaping innovative care in a place where it often matters most: at home. He is a model geriatrician and innovator, which reflects the heart of the Henderson Award." An internationally recognized leader and researcher in the development, evaluation, and dissemination of novel models of care, Dr. Leff's research interests explore not only where care takes place but also how that care can impact quality of life and well-being, particularly for homebound older adults living with complex health concerns. With a strong interest in the intersection between health care and health policy, Dr. Leff has served as a Health and Aging Policy Fellow with the American Political Science Association and as a technical expert for a range of panels brought together by the Centers for Medicare & Medicaid Services to better examine geriatrics and home health care. In these capacities, Dr. Leff has advanced much of what makes geriatrics a leading field for the future of care–from clinical practice guideline development to the evaluation and dissemination of new approaches to implementing geriatrics expertise. An AGS member since 1991, Dr. Leff also has helped lead the American Academy of Home Care Physicians and the American College of Physicians, and currently serves as the Chair of the Geriatric Medicine Board of the American Board of Internal Medicine. Dr. Leff received his B.A. from the University of Pennsylvania in 1983 and his M.D. from New York University in 1987. After residency and fellowship training at Johns Hopkins, he served as a medical officer in the U.S. Army in Seoul, Korea, before joining the Johns Hopkins faculty in the Department of Medicine in 1994. Edward Henderson, MD, namesake of the Henderson State-of-the-Art Lecture, was a beloved and respected geriatrician who served the AGS in several capacities, most notably as President, Vice President, and Executive Director. For more than two decades, Dr. Henderson's devoted efforts on behalf of the AGS made him an international authority in human aging and geriatric medicine. The Edward Henderson Award is one of several honors conferred by the AGS at its Annual Scientific Meeting. The 2018 award recipients include more than 15 healthcare leaders representing the depth and breadth of disciplines championing care for older adults. For more information, visit Meeting.AmericanGeriatrics.org.